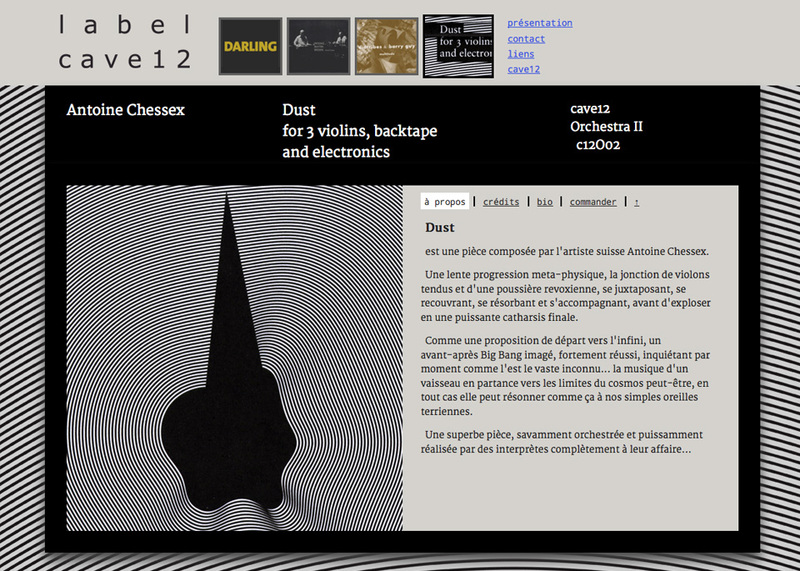 The website label.cave12.org gets a well-deserved update, on the occasion of the vernissage of the latest CD release, «Dust» (by swiss composer Antoine Chessex) occurring this Saturday, September 24th, at Bâtiment D’Art Contemporain, Geneva. The design of the individual release pages will reflect the album artwork of each release – in this case, the page design was derived from the original artwork by Eva Rittmeyer and Xavier Robel. Built with rock solid HTML5/CSS3 standards (courtesy html5boilerplate v.2.0). Uses two open-source webfonts: the very classy Merriweather for the body text in serif, and Droid Sans Mono for the menus.